The relevancy of search engine results is very subjective so therefore testing the relevancy of queries is also subjective. One technique that exists in the information retrieval field is the use of judgement lists; an alternative approach discussed here is to follow the Behaviour Driven Development methodology employing user story acceptance criteria – I’ve been calling this Relevancy Driven Development or RDD for short. I’d like to thank Eric Pugh for a great discussion on search engine testing and for giving me a guest slot in his ‘Better Search Engine Testing‘ talk* at Lucene EuroCon Barcelona 2011 last week to mention RDD. 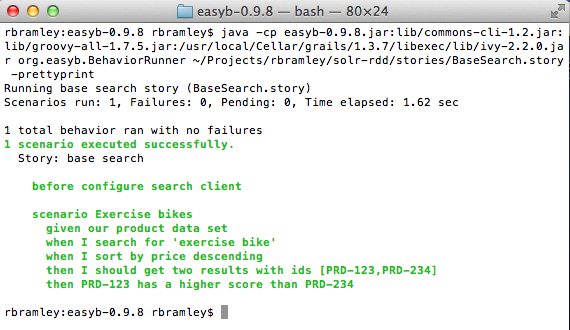 The first iteration of Solr-RDD combines my passion for automated testing with my passion for Groovy by leveraging EasyB (a Groovy BDD testing framework). plus delete_all.xml and optimize.xml for use with the Solr post.sh. Whilst this gave confidence that we could track the performance trends of any query changes or configuration tuning – it didn’t address the relevancy. For that we had another script, known as the SolrJ Query Tool, to execute pre-canned queries – although this didn’t have an automated feedback loop as the results would be emailed to the client for them to assess (there wasn’t a judgement list due to time constraints). If you read between the lines above, we would recreate the data to a known state before each test run. This is critical if you are to be able to make valid assertions about search results. The aim is to use a story format to describe query relevancy e.g. Using SolrJ this should be viewed as an integration test directly against Solr rather than as a functional test which uses an HTTP Client to interact with the primary web application. This was the essentially the alpha-grade implementation and for this run through I used Solr 1.4.1 as it was used for the project that made the idea concrete. I highly recommend mvnrepository.com for being able to track down dependencies and they have them directly in Groovy @Grab form. The code from the four sections above was saved as ‘BaseSearch.story‘ – the suffix instructs EasyB that it is a Story (as opposed to a specification). If we now change the SolrQuery.ORDER.desc to SolrQuery.ORDER.asc and re-run, we’ll see the failure output as shown in Figure 2. Note that the -txtstory argument will make EasyB output the stories in a ‘business-readable’ form. Feel free to suggest additional features or participate via the fledgling project on GitHub. * You can get an older version of Eric’s talk from here.